Gregor looked over the previous night's reconaissance reports. Imperial forces had been fighting a valiant holding action against the Tyranid horde for weeks. Forced to fall back by the sheer weight of enemy numbers, Imperial Guard units had rallied at a nearby spaceport, awaiting badly needed reinforcements due to arrive shortly. The chaplain winced in disgust as he read on. In the haste of their retreat, the Imperials had let a valuable computer data center fall to the foul aliens. Surely, the Tyranids could not have discovered the true worth of the ancient thinking machines. The best chance would be to strike the depot quickly, cleansing it of all the alien filth, and then recover the data center's core before the Tyranids could mobilize a counterattack. Chaplain Gregor - equipped with jump pack, bolt pistol, frag grenades, and the usual crozius arcanum and rosarius. Death Company (5 models) - Equipped with jump packs and usual array of close combat weapons. All Death Company also have frag grenades. Scout Squad Laertes (9 models) - includes one model with a shotgun. All other models are armed with bolt pistols and swords, as well as frag grenades. One brother succumbed to the Red Thirst. Attack Bike Squadron (2 models) - equipped with heavy bolter. Assault Squad Gideon (10 models) - two brothers carry plasma pistols. All the other models are armed with bolt pistols and close combat weapons. In addition, the squad has been issued frag grenades. Dreadnought Imperius - carrying a missile launcher and multimelta. Imperius also sports a smoke launcher. 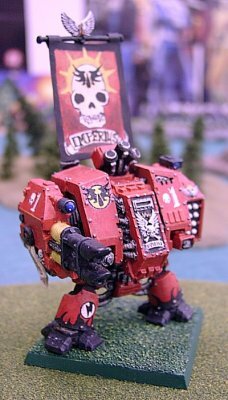 Dreadnought Furioso - carrying an assault cannon, power fist with storm bolter, and smoke launcher. Hive Tyrant (in reserve) - carrying a venom cannon and lash whip. We rolled "Change of Orders" for the mission. After rolling again, we came up with "Take and Hold." Sean rolled highest, so he elected to defend the ruined building we had placed on the map, leaving me to move on from the nearby board edge. He was able to place some units of troops, the Zoanthropes, and his Carnifex within the ruin, but he held back one Termagant brood for reserves, fearing that they might be broken and scattered without the presence of any synapse creatures. We also agreed that, as per White Dwarf 242, the two Lictors would be allowed to deploy secretly, even though normally elite choices must be held in reserve. Ordinarily, I don't take scouts because they are unusually vulnerable to spore mines. I figured I'd try a little switch this game; Sean has been so used to fighting Marines in powered armour that he seldom brings out Biovores any more. Plus, with the ability to bring in shotguns and mix them with close combat weapons, I figured I'd stand a fair chance in close combat with the smaller nasties. As infiltrators, they provided me a rare opportunity during this game, so I set them up between Sean's board edge and the ruined computer depot. As the attacker, the Blood Angels moved first. My entire army moved on from the board edge. I tried to organize my troops to maximize my fields of fire over two targets: the Termagant brood and the looming Carnifex. Blazing away with their bolt pistols, the Death Company was able to kill two termagants. Imperius launched a frag missle and fired his multimelta, but succeeded only in killing two of the little buggers. The attack bikes, dreadnought Furioso, and squad Adorno blasted the Carnifex, but after getting past his toughness of 6 (! ), he made five consective 5+ saves, allowing but a single wound to slip past his invulnerable carapace. Unable to roll for reserves on the first turn, the Genestealers were content to move forward behind the gargantuan form of the Carnifex. The Zoanthropes and Termagants blasted the approaching Blood Angels. Fortunately for me, all three Zoanthropes failed to hit, but two Death Company Marines fell under a rain of borer beetles fired by the Termagant brood. In the assault phase, Sean revealed the location of one of his hidden Lictors, who, while too far away to do any damage at first, would become a thorn in my side later in the game. I needed to stay away from the Genestealers and Carnifex, while maximizing my field of fire with squad Adorno. To this end I scooted the bikes back, while dreadnought Furioso moved over to reveal several well-armed Marines standing in his shadow. The scouts moved into bolt pistol range behind the Termagant Brood, while the Death Company closed on them from the front. My troops blasted the Termagants, eliminating ten of them! Without a synapse creature nearby, they broke and ran - falling just short of a crossfire against scout squad Laertes. The bikes, dreadnoughts and the tactical squad hit the Carnifex with everything they had, and again, he strode miraculously through the hail of fire unscathed! In the assault phase, my scouts rushed the Termagant brood. Unable to rally, they were scattered before the Emperor's righteous fury. I new my number was up when the Hive Tyrant arrived. This time, he was escorted by a brood of three Tyranid Warriors. For starters, the Hive Tyrant blasted Imperius with his venom cannon. The resulting explosion scattered flaming wreckage over a wide area, killing one member of squad Gideon. The Zoanthropes managed to kill two tactical Marines and one attack bike, but fire from the Warrior brood was ineffective, killing not a single scout they aimed for. In the assault phase, Sean revealed the location of the second Lictor. He was hiding in the woods near my scout squad! He leapt out of the bushes and rushed them, slicing one poor scout in half with his razor-sharp claws. The scouts, horrified, fell back towards my deployment zone. The Zoanthrope charged into the midst of the Death Company, inflicting no wounds, but receiving none in return due to his Warp Field. I won the "Moral High Ground," though, and Gregor closed around the side of the Zoanthrope, brandishing his Crozius menacingly. Luckily, my rolls for Black Rage were holding well. Nobody moved out of place, and I had the perfect position from which to extract revenge for my dreadnoughts. The scouts moved to surround the Lictor, bolt pistols at the ready. Assault squad Gideon moved up towards the nearby Tyranids, charging their plasma pistols for the slaughter to come. In the shooting phase, rapid fire from the remainder of squad Adorno and the pistols of squad Gideon blasted the remaining six Genestealers into a heap of corpses. I tried desperately to wound the Carnifex with the attack bike's heavy bolter, but his thick hide was too much for the wrath of my weapon. In a desperate assault, Sergeant Gideon and his men surrounded the slow-moving Carnifex. Fueled by the fury of their long-dead Primarch, the raging Blood Angels were able to carve another wound from its hide, while, due to poor rolling on Sean's part, took no losses themselves. I still had reason to fear, however, for I knew that next assault phase my Marines would be striking at strength 4 again, which meant I'd need a '6' to wound the Carnifex! The scouts teamed up on the lone Lictor, and sacrificed one of their number while purifying it with their weapons. Chaplain Gregor's crozius carved a crackling arc through the Zoanthrope's warp field, bringing the hideous beast crashing to the ground. Sean first rolled reserves, and the second Termagant brood entered the fray, this time within range of the nearest synapse creatures. His Tyranid Warriors and the Hive Tyrant moved closer to the objective, while his two Zoanthropes moved cautiously around it. During the shooting phase, the Tyranids' guns hammered my scouts, and after losing two more men, I failed my Morale test and squad Laertes retreated once again. The second Lictor, who, until just now had been hidden from the battle behind a stand of trees, launched himself against squad Gideon, hacking one Marine limb-from-limb before bounding back into the brush, taking no wounds in return. I knew I had to stop the Lictor from killing more of my assault Marines, or else I might not have enough troops to take the objective. To this end, I moved squad Adorno into the woods in a desperate attempt to flush him out. The Death Company swooped into the ruined depot with their jump packs, angling towards the lone Zoanthrope that they could see. My scouts and my attack bike moved towards the Tyranid Warrior brood in the hope that I could eliminate their telepathic presence and rout the Termagants with some clever use of my firepower later. During the shooting phase, the Death Company's pistol shells glanced harmlessly off the Zoanthrope's Warp Field, but Sergeant Adorno's bolter found its mark, wounding the Lictor. The scouts and the attack bike managed to fell a single Tyranid Warrior carrying a Deathspitter. In the assault phase, squad Adorno charged the Lictor, but for all their effort, they were rewarded with the death of one of their brothers before the slippery beast tore off into the wild. Gregor easily dispatched a second Zoanthrope, and took cover in the ruins under the watching guns of the Tyranid Warriors. The scouts and the bike were too far away to assault anyone, but I figured the bike's high toughness and good saving throw would draw most of the enemy fire next turn. Sean moved his Tyranid Warrior brood so they could see one member of the Death Company, and blasted him to pieces with a well-aimed venom cannon shot. The last Zoanthrope missed (again! ), and the Hive Tyrant's fire resulted in not a single casualty. The Lictor had moved towards the ruins, but he was still too far away to assault anyone. I moved squad Gideon into the ruins, and set up behind the rocks and rubbled walls, aiming for the approaching Tyranids. At this point I had the objective - all I needed to do was keep squad Gideon alive long enough to hold it. I moved the bike, the scouts, and the Death Company out to face the Warrior brood and the remaining Zoanthrope. After relatively inneffective shooting, they charged in to fight at close quarters. Gregor sliced through the last Zoanthrope with ease, and the scouts and bike faired well against the Tyranid Warriors, killing one of them. Unfortunately, I lost one scout and the "Moral High Ground." My scouts and bike broke off, pursued by the lone Tyranid Warrior who was (fortunately) unable to catch them. Sean's fire was fairly ineffective, killing another scout with a venom cannon shot, but inflicting no wounds on the bike or the Death Company. In the assault phase, the Termagant brood mobbed the Death Company, felling one of them and wounding Gregor for a loss of only two Termagants. I lost the "Moral High Ground," but because of the blood-crazed nature of the Death Company, continued fighting. The Lictor leaped through the ruins and attacked squad Gideon, but was unable to cause any wounds. Our return was equally ineffective, and the combat ended in a draw, with me holding the "Moral High Ground" this time. The last Tyranid Warrior charged the last scout, but he survived as well. Then, Sean rolled a '2' for random game length, and the game ended there. Finally! A victory for the Blood Angels over the infernal Tyranids! While I had to agree with Sean that another round probably would have meant doom for too many of my models to hold the objective, sometimes you don't have all the time you want to fight a battle. 1). We noticed at one point that squad Gideon survived a deadly charge by the alien Lictor. Under the new rules, when a squad is assaulted by a Lictor and loses, they fall back automatically! Oops! I overlooked this in the bottom of turn 3. 2). It is important when doling out wounds to squads that have multi-wound creatures that you remove whole models one at a time. This came up when I inflicted three wounds on the Tyranid Warrior brood - you must remove whole models when possible, as per the rules on page 53. The obvious dilemna this poses is in the case of the Death Company, where a multi-wound model (the Chaplain) is leading a bunch of single-wound creatures who can ignore a wound dealt them! Sean questioned whether he could apply two wounds against the Chaplain, thus causing a casualty, since the Chaplain can not "ignore" wounds like the Death Company can, but I think in this case it is better for the defender to allocate the wounds amongst his troops and then see who is still standing - keeping in mind that, in all fairness, even the Chaplain will have to take a hit for the team if all of his comrades have been hit as well. In any other situation involving a multi-wound character leading a band of lesser troops, I think it's safe to say the procedure would be similar, in that the wounding shots would first strike the foot troopers before finding their mark on the leader. Enthusiastically, we both give the new Lictor rules in 242 thumbs up, as they actually became effective and well worth their points cost instead of being over-priced targets for marauding enemy units.